MCL Knee Injury, like any other knee ligament injury, should be taken seriously as the injury can only get worse with trying to force playing through the pain. MCL or Medial Collateral Ligament is one of the FOUR major ligaments that hold the knee together, preventing it from sliding left and right or back and forth. MCL knee ligament is made up of tough fibers that connect the end of femur (thigh bone) and the top of tibia (shin bone). MCL injury usually happens when the outside of the knee is struck, bending the knee inwards and causing MCL ligament injury by stretching or tearing the MCL ligament. Every knee injury is serious, and MCL injury may involve other knee ligament Injuries, most commonly ACL knee ligament, and/or the Meniscus injury. Most common symptom following the MCL knee ligament injury is instant pain over the ligament. Swelling and bruising may be expected 24-48 hours after the MCL knee ligament injury occurs. In more severe MCL sprains, knee feels like it is buckling or feeling unstable under pressure. MCL ligament injury is categorized into three categories, depending on severity of the injury. Grade I injury to the MCL ligament comes with a mild sprain to the MCL ligament where less than 10% of ligament fibers are torn due to overstretching of the ligament. Symptoms for Grade I MCL injury are minimal. Pain can be felt by putting pressure on the injured MCL ligament and small discomfort with bending of the knee. Soccer players can usually come back to the sport in 2-4 weeks after Grade I injury occurs. RICE (Rest, Ice, Compress and Elevate) method will ensure proper healing. Grade II MCL injury occurs with a more severe sprain due to impact to the outside of the knee. MCL ligament stretches beyond its limits causing more than 10% of ligament fibers to tear, however complete tear of the ligament is not present. Symptoms for MCL Grade II injury include pain and tenderness to the touch of MCL, as well as moderate swelling to the inside of the knee. Grade II MCL injury will follow with loose feeling on the inside of the knee, especially when attempting to pivot or cut when running. This MCL injury to the knee will require 4 - 8 weeks of rest. Applying RICE (Rest, Ice, Compress, Elevate) is the first step in treating any knee injury, including MCL ligament injury. Third degree MCL injury of the knee occurs when the MCL ligament is completely torn. This type of injury to the knee will follow with instant pain, swelling, inability to bend the knee and instability of the knee. It is important to mention that Grade III MCL ligament injury may be less painful than Grade II MCL injury. In most cases surgery will not be required, and ligament tear is treated by wearing a knee brace, resting and doing strength exercises once pain subdues. Grade III MCL ligament injury will take a minimum of 8-12 weeks to fully recover. Treatment begins with immediate RICE (Rest, Ice, Compress, Elevate) applied to the knee. Begin with letting the pain subside, than work on mobility of the knee, following with strengthening of the knee before returning to sports and activities. Hinged knee brace is great for recovering from an MCL injury as it adds the needed support to the torn ligament. It is important to seek Professional opinion anytime there is a more severe injury involved, as it may have injured other knee ligaments at the same time MCL injury occurs. 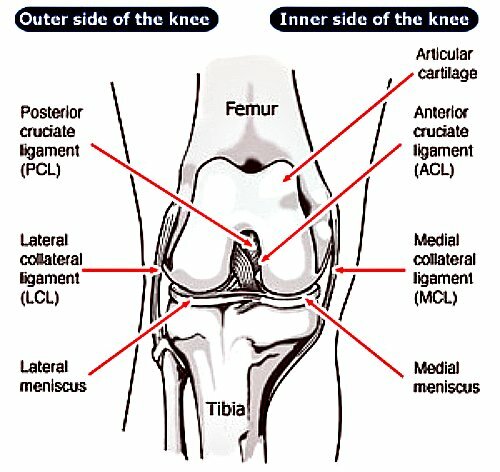 For more information about MCL ligament injury visit Medial Knee Ligament Injury.